If you are an IT teacher, coordinator, director or just the techy teacher in your school, you’ve had to make instructions for people. Any technical instructions worth their salt have nice screenshots, are organized and are clearly written. Believe me, I’ve seen some terrible instructions where pictures are improperly resized, the pictures are not annotated and difficult to see how it fits in with the steps and/or there are no pictures at all. At any rate, if you’ve ever had to make such instructions, you know how time consuming it is because you usually are using some word processing program (Word, Pages, Google Docs) then a screen shot program (Skitch, Voila, etc) then you are copying and pasting those images into the document. Argghhhh – it even takes a long time to write about it! There is a solution. It is a program called Clarify. It works on Mac and Windows (no iOS, Android or Linux) and it lets you take screen shots, annotate (you know draw circles, arrows, etc) and then write instructions for that screenshot. Then once your instructions are done, you can then publish them on the web through their server, WordPress, Dropbox or Evernote. You can also export it as HTML, PDF or Word document. Pretty snazzy no? You can find this program through their website http://www.clarify-it.com/ or through the Mac App store but I recommend buying it through their website. You will get the updates faster and all of the money goes to the developer which is a good thing people. 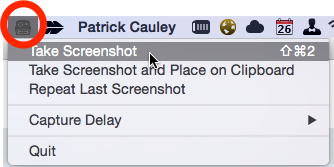 FYI – I am using Skitch to take the screenshots. While Clarify can do it – I find it much easier to get certain aspects of Clarify in action using a third party software. I’ll assume you’ve downloaded the program, opened it up and are ready to make your first set of instructions. Great! Before you take your first screenshot go ahead and give your project a title and description. Now let’s take that first screen shot. When you do this, it automatically creates a step. To do this, you have lots of options. One, you can use the keyboard shortcut (for me on my Mac it is ⌘ + Shift + 2 if you have a Windows machine it will be different), you can click on the camera button in Clarify itself. You can also use the menu bar option (located at the top of your screen). These all do the same thing. When you take the screenshot you have a number of options. You can resize (right click the image), you can annotate (check out the toolbar below). A few notes to consider. 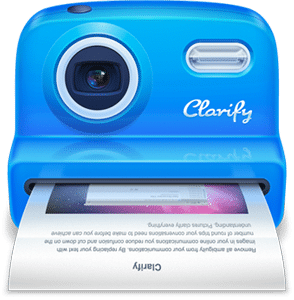 You can only add one image per step, but the good people at Clarify have thought about that. Go ahead and make a new step but instead of giving it a title, leave that blank. What Clarify will do is keep those steps formatted very closely to one another making it appear they are all part of the same step. Nifty huh? Also, spell check is not on by default. After you’ve typed your instructions, run spell check through the program (you can find it under the Edit menu option). I am supremely confident this is done on purpose as they want you to re-read your instructions before publishing or sending them out to people. Come on – that’s a good idea. One of the best features of Clarify is the fact that it can be published straight online. You can publish it to Evernote, Dropbox, a WordPress blog but the best option in my opinion is being able to publish it straight to Clarify’s servers. The end product looks great, they give you a link, it gives you basic stats of how many times it was viewed. Check out one of mine by following this link. You might be saying to yourself Damn-this is great! but wait there is more. If you want to make changes to your document, just open it back up, make the changes and re-publish it. It will take down the old content, replace it with the updated content and keep the URL (or web address) the same, so people who have booked marked it will get the latest and greatest guide you’ve made! Yep, more good news coming your way dear reader. Clarify has fantastic support. Let me tell you of my experience. I upgraded Clarify a few months ago but it kept crashing on my computer. I contacted Clarify about it and they got back to me within 12 hours (that’s fast people). I sent them my crash report and they have said that the problem was with my computer and not their program (which it was) and leave it at that, but NO! Off and on for about a month we worked the problem together and finally pinpointed exactly what it was. I had an obscure program running in the background which was conflicting with Clairfy. I removed the program and have never had an issue since. AWESOME! I’ve said wuite a bit about Clarify and now here is my personal testimony. I’ve made over 100 guides using this product. I wouldn’t think of using anything else really. It is easy, effective, it allows you to easily disseminate your info to your audience. I am sure that there are others of you out there who would benefit from it. Don’t balk at the $30 price – it has easily saved me more than that in time over the past three years. This entry was posted in Helpful Tips, Patrick Cauley, Review and tagged clarify, guides, instructions. Bookmark the permalink.